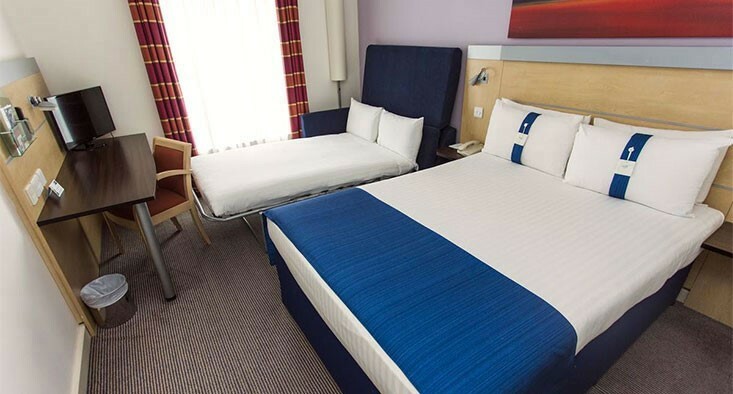 The Express by Holiday Inn at East Midlands airport is practical and great value. You’ll get lots of freebies, like free wifi and free breakfast - it’s a great money-saving option. And it’s less than 5 minutes from the terminal. Rooms are comfy and practical, with the choice of soft or firm pillows and triple glazing, so you won’t hear a thing. There’s free wifi and all you need to make tea and coffee. Accessible rooms are available - just contact the hotel before you arrive. From the south via M42/A42 follow the signs to Nottingham East Midlands airport. At the end of the A42 follow the signs for A453. The hotel is located on Pegasus Business Park. From the M1, exit at Junction 24 and follow the signs to Nottingham East Midlands airport (A453). The hotel is located on Pegasus Business Park. The nearest station is East Midlands Parkway. If you’re arriving by public transport, phone the hotel on 0871 902 1609. The hotel will organise transfers by taxi (£6.50 approximately per taxi).